Whether a family van or a rugged commercial truck, it must be dependable. GMC provides owners with vehicles that meet these needs while providing comfort and convenience. This merger of amenity and performance gives drivers an option that provides all the bells and whistles of other brands but with power they often can’t match. Having a vehicle that is capable of so many different purposes presents a unique need when it comes to service and repairs. Some shops specialize in one brand or one type of vehicle. One that is a specialist in commercial vehicles may not be the best option for your personal GMC. As automotive technology pushes the limits of what is capable in vehicles, it can become difficult to know for sure whether your service center is up to date. No matter how you use your GMC, it has to keep you safe. You deserve only the best for your GMC service and repair work over the years. 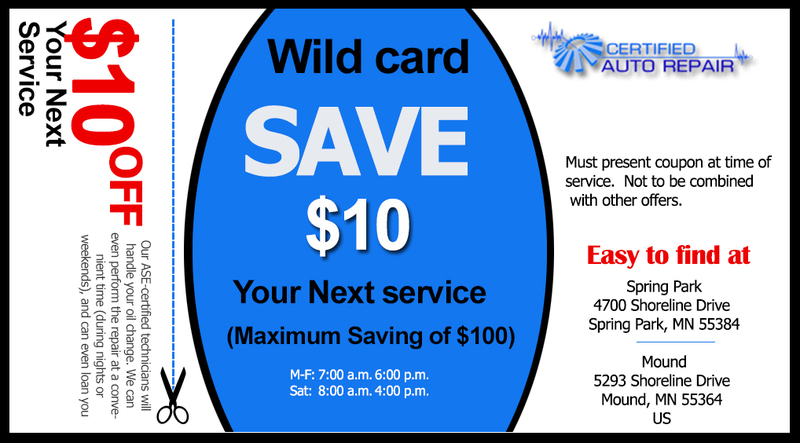 Certified Auto Repair in Mound and Spring Park is here to help. Our foundation is based on being a local option that you can trust. We use only ASE Certified technicians, each of whom has several years of hands-on experience in the industry. Being hands-on with diagnostic equipment and specialty tools is something that can’t be overstated. As the area’s AAA Approved shop, we have achieved a level of customer satisfaction that meets very high standards. Combine our expertise with our long-term guarantee on the work we do and you know you’ve found something unique in auto repair. Our founder lives in the west metro and began Certified Auto Repair over 10 years ago with the single goal of creating an experience that’s unique for our customers. Our free local shuttle service and free loaner car program can get you out of the shop and on with your day. Being open weekends and evenings means you have convenient appointments available. Stop in and give us a chance to earn your trust; and then your business. We know that once you see what makes us different, Certified Auto Repair will become your regular service shop for your GMC and future vehicles.